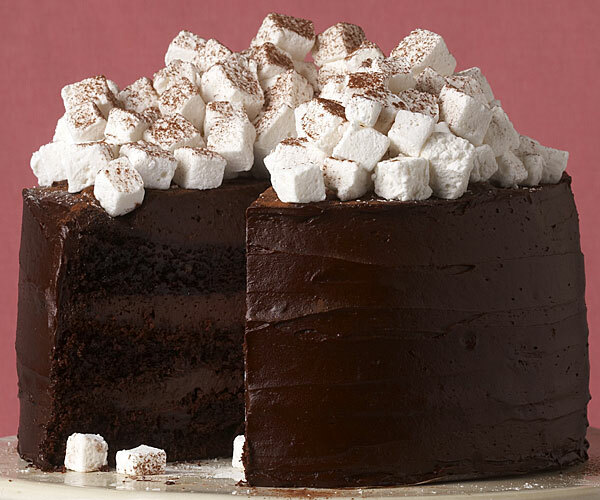 All the rich flavor of hot chocolate—in cake form. Homemade marshmallows piled on top seal the deal. Position racks in the bottom and top thirds of the oven and heat the oven to 350°F. Butter three 9×2-inch round cake pans and line each with a parchment round. Butter the parchment, then dust with flour and knock out the excess. In a 4-quart saucepan over low heat, combine the cream, butter, and vanilla bean and seeds and stir until the butter is melted. Remove the vanilla bean and whisk in the chopped chocolate until melted. Whisk in the sugar, cocoa powder, syrup, and salt until smooth—be sure the cocoa powder dissolves completely. Pour into a 9×13-inch pan and freeze until firm, about 2 hours, or refrigerate overnight. Add the vanilla, carefully increase the speed to high, and beat until the mixture has thickened and cooled, about 5 minutes (the bottom of the bowl should be just warm to the touch). Line a 9×13-inch pan with foil, leaving an overhang on 2 sides. Sift 1 Tbs. of the confectioners’ sugar into the bottom of the pan, then pour the marshmallow mixture into the pan and sift another 1 Tbs. confectioners’ sugar on top. Let sit at room temperature until set, at least 2 hours. I've made this cake 3 or 4 times because it's hands-down the best chocolate cake ever. The cake is moist and the icing is basically a whipped chocolate ganache, which is pure heaven and not sweet. It's definitely a cake for chocolate lovers. If you don't like dark-ish chocolate, it may be too rich. The homemade marshmallows seem daunting, but are quite simple if you have a candy thermometer and are comfortable cooking sugar (it takes some precision with the temperature). I don't eat the marshmallows myself, but they're a crowd-pleaser and always a conversation starter! The cake freezes well, and arguably tastes better still frozen (it's fudgey when freezer cold). I have looked past this recipe many times thinking that if it looks this good it must be more about looks than flavor or taste. I was wrong. The texture, the flavor and the visual impact were amazing. I didn't modify at all except to check for doneness about 3 minutes early. And it was done. I would not say it's dry at all but I don't need every cake to be wet and gooey. 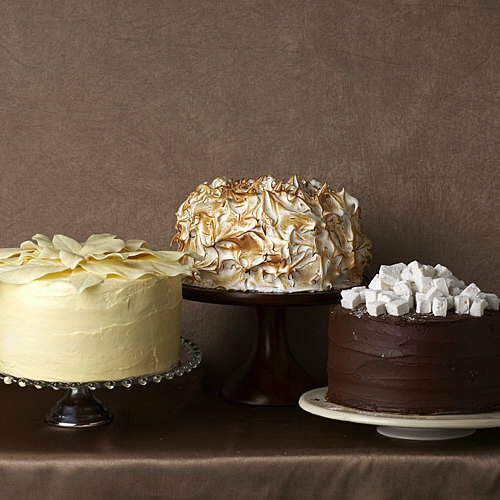 I think the contrast between a fine crumb "grown up" cake and the amazing silky fudge like frosting was awesome!!! And it tastes like rich hot cocoa. Make sure you have it with coffee - amazing!!! Hands-down my favorite chocolate cake. Rich, moist, and intensely chocolatey. Every time I have this, it reminds me of Mrs. Trunchbull's cake. I have been too lazy, thus far, to make the marshmallows. I will someday, but the cake is perfect even without them. It is worth the time and it's worth using the best ingredients you have. (I prefer to use Callebaut cocoa and chocolate, around 65%.) This is a recipe that has turned me off of trying new chocolate cake recipes, and I can't wait to make it again.